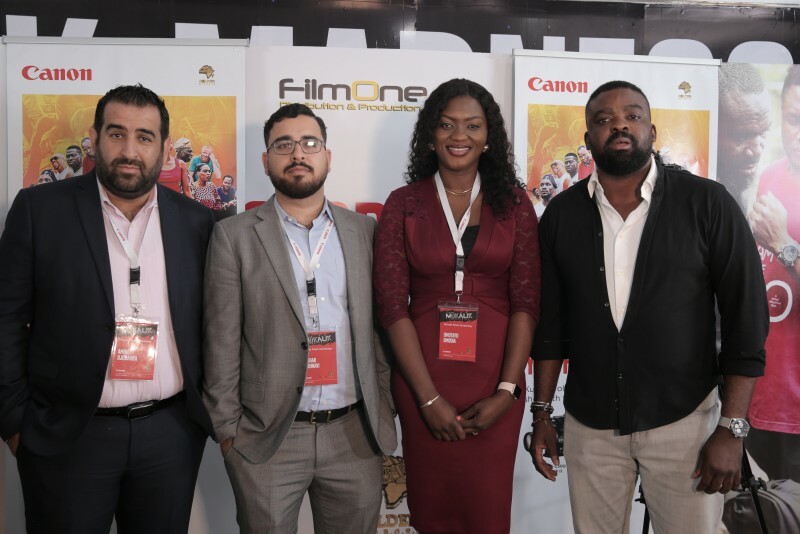 Leader in imaging solutions, Canon Central and North Africa, recently hosted a private press screening of Golden Effects Pictures latest movie, ‘Mokalik’. The private screening had exclusive guest attendance including members of the media, key industry stakeholders, cast and crew. Following the Mokalik movie screening, produced and directed by award-winning Nigerian filmmaker, Mr Kunle Afolayan, using the Canon EOS C300 Mark II along with range of Canon Cinema Lenses CN-E14mm, CN-E24mm ,CN-E35mm, CN-E50mm, CN-E85mm and CN-E135mm, Mokalik stars the popular singer, Simi, alongside prominent actors such as Femi Adebayo, Charles Okocha and Faithia Williams through a deeply personal tale. The movie follows the career of an 11-year-old boy, Jaiye – who spends a day as an apprentice at a mechanic workshop in order to have an alternative view on life. When his father arrives to take him home, Jaiye has to make up his mind if he wants to return to school or take on being a mechanic full time. Speaking on the screening, Mr Afolayan said, “Mokalik is an ambitious film project that tells a story which is unique and relevant to our society. “It beautifully highlights diversity while distinctively addressing the issues around choice. “Creating this movie has been an amazing experience and Canon made the experience even better with their support. “The Canon EOS C300 Mark II – Stunning 4K quality and versatility allowed me as a producer to experience creative vision in stunning cinematic details & provide footage suitable for extensive post-production work. “The EOS C300 Mark II with canon cine lenses range also helped the team to technically get one step ahead and create a world-class movie which promises to break boundaries. Commenting at the screening, Amine Djouahra, Senior Sales & Marketing Manager – B2C, Canon Central and North Africa (CCNA) said, “At Canon, we are constantly seeking to connect with the filmmaking community, especially Nollywood as it allows us to become a part of one of the largest film industries globally. “The technical brilliance witnessed in this movie, is testament to Canon’s pioneering vision in the realm of serious cinema production, we are glad to be a part of this bold new technology that helps to make amazing projects like the MOKALIK possible”. Adding on “at Canon we continue to listen to our customers when developing the product range to ensure our innovations meet their needs enabling storytellers for creative filmmaking. The EOS C300 Mark II Digital Cinema Camera is an evolutionary 2nd generation Cinema EOS 4K camera system with a wide range of new and improved features including 4K/2K/Full HD internal and external recording and a new 10-bit Canon Log 2 Gamma. Focused to help to deliver more creative flexibility for professional studio motion picture production applications, as well as independent productions, TV dramas, commercials, news features, sports and more, the EOS C300 Mark II is an ideal choice.